Uses (2) 2521 HF1 (180 PSI) Membranes (polyamide) rated for a typical Salt Rejection of 98.5 %. Typically replace every 3-5 years. 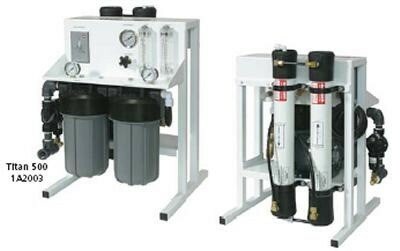 Comes with a 4.5"x10" sediment filter and carbon block. Connections: Feed: 3/4" Product: 3/8" Waste: 3/8"
Be sure to have a Product Flow Meter and Concentrate Flow Meter installed onto this system.